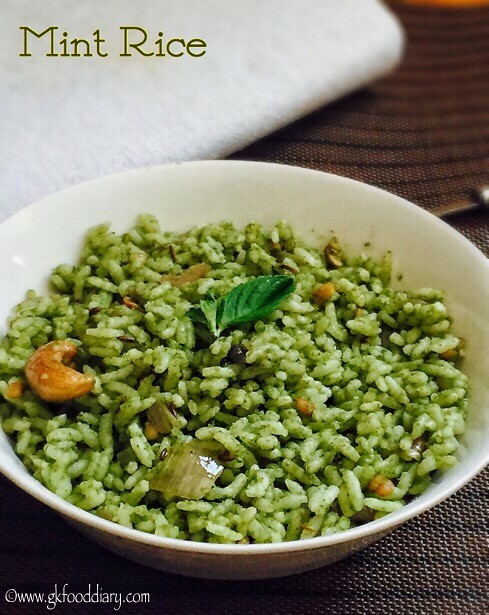 Mint rice/ pudina rice / Pudhina sadam- a flavorful rice made with mint leaves, which is apt for lunch box. Mint leaves are known for its health benefits including improving digestion & act as a good appetizer ! This healthy mint leaves can be included in kids diet in the form of chutney/dip, spread for sandwich, or add it to pulaos and biryani. 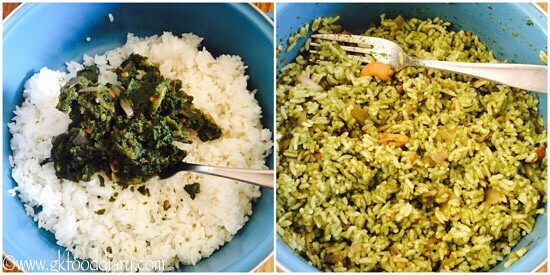 This mint rice preparation is similar to this coriander rice which I posted a while ago. 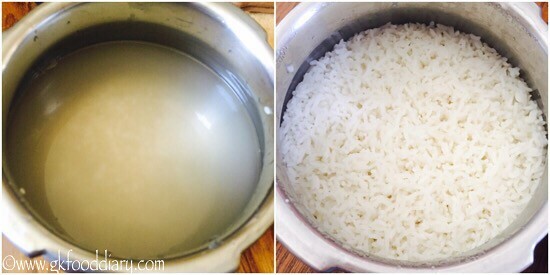 This mint rice can be given to babies after one year and once the baby is started eating with the family! 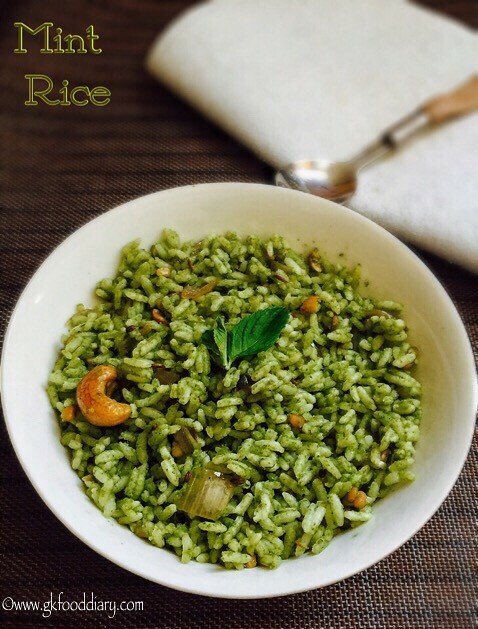 Here is how to make easy mint rice recipe for toddlers and kids. 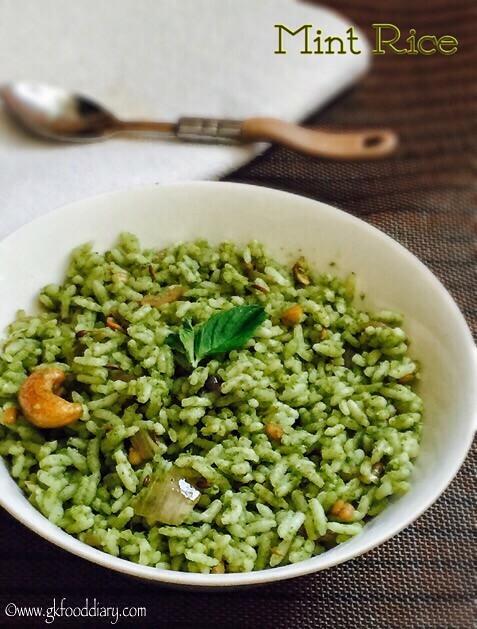 Mint Rice - A quick flavored meal made with rice, spices and mint leaves. 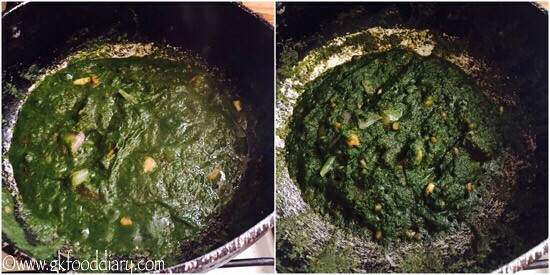 Wash and roughly chop coriander leaves & mint leaves. Keep aside. Slice onions. Chop green chilies. Set aside. Then Grind the coriander leaves, mint leaves , green chilies and Half of the chopped onions with little water to a fine paste. Keep it ready. Heat a kadai with remaining oil. Add all the items listed to temper. 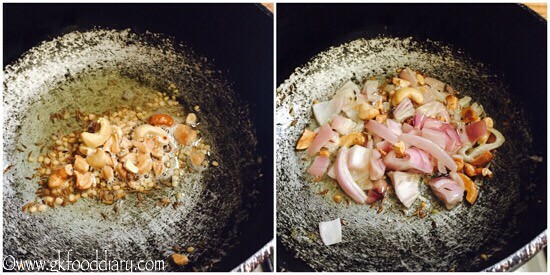 Let cumin seeds crackle and urad dal & cashews turns brown. Then add the remaining onions. Saute them nicely until golden brown. Once onions becomes transparent , add ground coriander mint onion green chili paste. Add required salt. Give a quick stir. Cook for 5-7 minutes or until oil leaves from sides. Switch off the flame once done and cool it down. Mix the mint gravy with cooked rice using a fork slowly. Mix well until the gravy is well coated with rice. Give at least 15 minutes resting time and serve. 2. 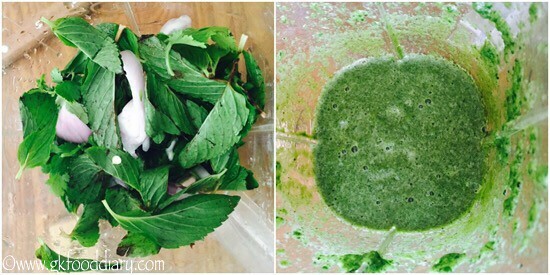 Wash and roughly chop coriander leaves & mint leaves. Keep aside. Slice onions. Chop green chilies. Set aside. 3. Then Grind the coriander leaves, mint leaves , green chilies and Half of the chopped onions with little water to a fine paste. Keep it ready. 1. Heat a kadai with remaining oil. Add all the items listed to temper. Let cumin seeds crackle and urad dal & cashews turns brown. Then add the remaining onions. Saute them nicely until golden brown. 2. 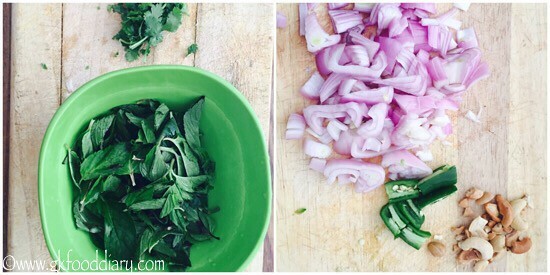 Once onions becomes transparent , add ground coriander mint onion green chili paste. Add required salt. Give a quick stir. Cook for 5-7 minutes or until oil leaves from sides. Switch off the flame once done and cool it down. 3. Mix the mint gravy with cooked rice using a fork slowly. Mix well until the gravy is well coated with rice. Give at least 15 minutes resting time and serve. Serve the mint rice with curd or any stir fry of your choice! Hope you liked this recipe. You can add more green chilies if you want it spicy. You can even make this mint rice with left over cooked rice too. Make sure to introduce everything separate before you try this mint rice to your baby.